Campus is in lockdown after an anonymous caller reportedly told police: "My roommate is on his way to Yale to shoot people." 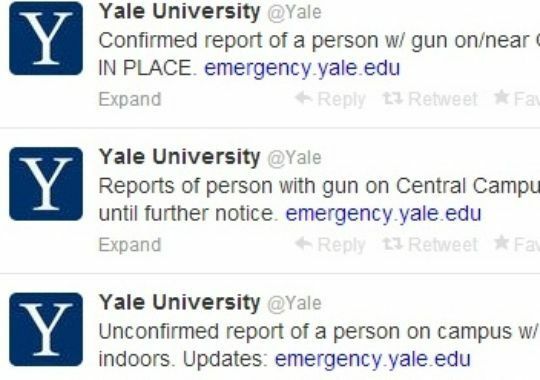 Yale University has urged students to "shelter in place" following a report of a gunman on campus. 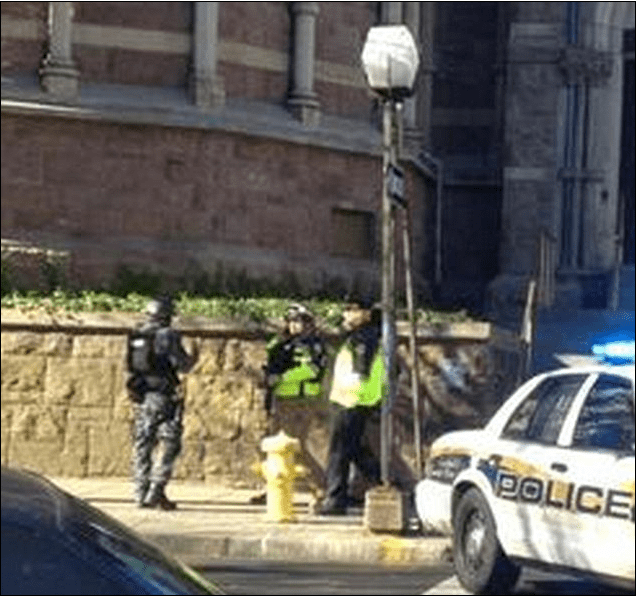 SWAT teams have been sighted at the university, according to college newspaper Yale Daily News. Students have received a text message saying: "Confirmed report of person with gun on/near Old Campus. Shelter in place. This is not a test." Police got an anonymous phone call from a phone booth at around 10am local time reporting a person on campus with a gun. Streets close to the campus have been blockaded, according to reports. The FBI is looking at footage of the area around the phone booth to identify the caller. Detectives say there have been multiple reports of a person seen with a long gun on or near campus. Several New Haven schools are on lock down, as well as a community college. A local news correspondent at the scene says she was told by an officer: "He's somewhere in this vicinity. Get out!" New Haven Police Department Lieutenant Jeff Hoffman said there have been no shootings and no injuries. Yale has been on November recess since Saturday, meaning many students have left to celebrate Thanksgiving. If the threat was real, why do it when most students are off campus? And any reports of people seeing someone with a gun after the alert went out could be just people who thought they saw a gun or they could have seen a police officer with a gun. I was thinking maybe it was someone just trying to get out of a test but since the school is on break that doesn't fit. "By what means will you defend yourself?" Police were investigating a possible hoax after Yale University was locked down for several hours Monday as police and SWAT teams found no trace of a reported gunman on the New Haven campus. University officials instructed students and staff to "shelter in place" after an anonymous 911 caller said just before 10 a.m. that his roommate wanted to shoot up the school and was heading to the main campus with a rifle, according to police. By 4:40 p.m., the school had lifted the shelter-in-place and lockdown orders for all parts of campus. Most students have already left campus for the Thanksgiving holiday. 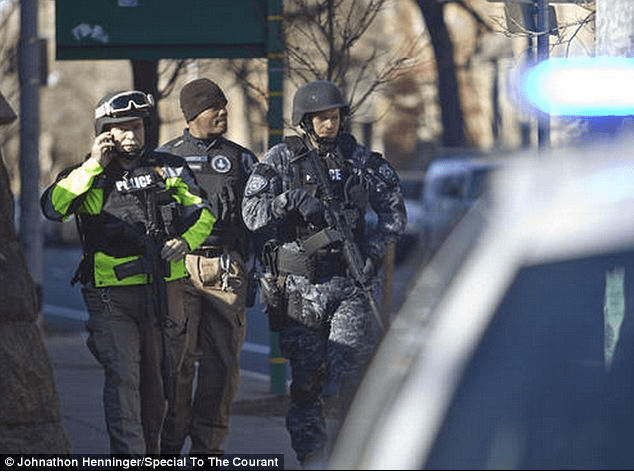 The Ivy League university issued its initial lockdown order at 10:17 a.m. ET. Police say the tip was called in at 9:48 a.m. from a phone booth near campus. The caller said his roommate had a long gun, according to police spokesman officer David Hartman. The caller, who did not identify himself as a Yale student, stayed on the phone only a few seconds. Hartman said "several" witnesses later told police they saw someone with a rifle or shotgun on the loose. But the call may have been a hoax, New Haven Police Chief Dean Esserman said at an afternoon press conference. The caller "sounded like a confused gentleman. I wouldn't describe his words as clear and concise," he said. 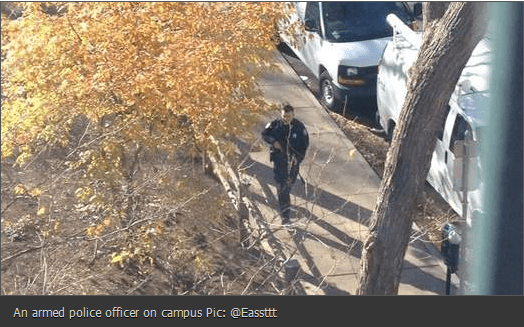 Yale University, using Twitter, reported a gunman on or near its Old Campus on Nov. 25, 2013. Police were interviewing several people who were not sure "if they saw a police officer with a gun or a citizen with a gun," Esserman added. Investigators were also trying to track down the caller. SWAT teams were dispatched in and around the campus and quickly blocked off several streets near the Old Campus, in the heart of New Haven. Several police departments, the FBI and other federal agencies were involved in the search. The university's initial announcement said: "Confirmed report of a person with gun on/near Old Campus. Shelter in place.This is NOT a test." "Out of an abundance of caution, Police will be doing a room to room search starting with the residential college areas," the university announced on its website. "When they knock on your door, a Yale police officer will slip their Yale ID under the door. Please cooperate. In some cases, police may use keys, but they will identify themselves. Shelter in Place continues." The announcement was also made through the loudspeakers on campus, the New Haven Register reported.